Junk and Rubbish Removal Services in Hawaii. 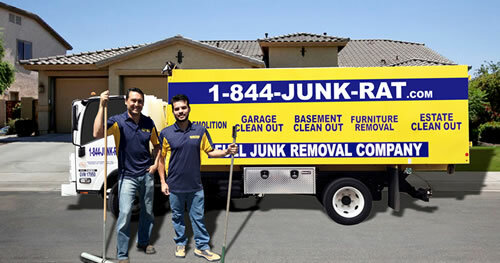 At 1844-Junk-Rat – junk and rubbish removal in Hawaii is made easy… because we do all of the work! Hawaii may be an island, but that doesn’t stop the junk people at 1844-Junk-Rat.com from offering residential and commercial junk removal services that are affordable for all project levels. When you call our office for your garage clean out, relocation clean up, construction debris removal, or commercial junk removal project you will be supplied with professional trained junk removal specialist. Our junk removal specialists take care of all the work and handle all the heavy lifting to ensure you are completely satisfied. We take of loading, labor, sorting, hauling, recycling, donation and disposal of all your junk. To make it better, we also clean up the area after the truck is loaded for no extra charge. No matter what size junk removal project you have, we are here to help. Junk is our specialty and customer service is our pride. When I was searching for some one to help me with my basement clean up project, I kept running into the issue of companies not wanting to deal with smaller projects or those who wanted to charge outrageous rates for small amounts of waste. After a little research I stumbled upon 1-844-JUNK-RAT.com. I read through some of the raving reviews and decided to give them a call. The agents were very personable on the phone and spoke to me with respect even though I only had a small job. When they came out for my basement clean up, they completed the service completely and quickly. They called before they came out to confirm the appointment and arrived before the anticipated time, which you know is rare in the service industry. The company is so reliable, they moved out all the junk I needed and mentioned that they would recycle the items that qualified and dispose of the rest in a safe way. Despite being a small job, the rates were very affordable for the outstanding service they provided.